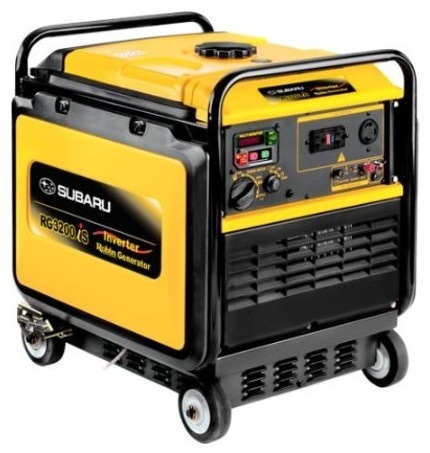 This quiet Subaru RG 3200is inverter generator is ideal for camping and tailgating parties. It is compact and easy to start and store for any power outages you may experience in your home. This product costs about $2,100 on Amazon. It comes with four non-flat wheels for easy portability. It also comes with a three year warranty for both consumers and commercial users. It has a steel tubular frame that helps protect the exterior of the generator. The main feature is the clean power output for TVs, laptops and other sensitive electronics. It is able to run 1,650 rated watts and 3,200 maximum watts. An additional feature is the electric start. The three layer steel fuel tank that gives longer run time between refills. It is able to carry up to 3.7 gallons of fuel and it weighs about 130 pounds. Other features include the automatic power system that adjusts the engine speed to meet the power requirements and allows the generator to get greater fuel efficiency, the clean sine wave and minimum noise level of 58dba. This product is recommended for its portability and durability. It is able to run up to 8.4 hours at half load. It also has sound absorbing foam lining to minimize sound.